Claimant sustained a work related injury when a supervisor hit a wrong button, causing a machine to be activated, crushing her arm. Following the injury she tested positive for marijuana which violated a written work rule and her employment was terminated. Her claim was allowed but claimant’s motion for temporary total disability compensation (“TTD”) was denied by the District Hearing Officer, who found claimant voluntarily abandoned her employment when she tested positive for marijuana. The Staff Hearing Officer vacated the order and found claimant did not voluntarily abandon her employment, citing State ex rel. Gross v. Indus. Comm., 115 Ohio St.3d 249, 2007-Ohio-4916, and finding a pre-injury infraction undetected until after the injury is not grounds for voluntary abandonment. The company appealed to the full Commission which found the company met its burden of proving the order contained a clear mistake of law and granted the request for reconsideration. After hearing the issue on the merits the Commission determined claimant was not entitled to TTD because she voluntarily abandoned her employment when she tested positive for marijuana violating a written work rule. Claimant filed a mandamus action in the Tenth District Court of Appeals and the court adopted the Magistrate’s decision and granted a Writ of Mandamus. The Court emphasized the employer never argued the use of marijuana adversely affected her judgment or proximately caused the injury. The court found the doctrine of voluntary abandonment did not apply to the receipt of TTD compensation in a case involving a pre-injury infraction undetected until after injury. Voluntary abandonment does not apply to prohibit receipt of TTD in a case involving a pre-injury infraction (marijuana use) undetected until after injury (in a post injury drug test). There is still time to register for our Annual Labor & Employment Law Seminar but hurry, time is running out and seating is limited! This year, as a thank you for attending our seminar, attendees will have a chance at winning an iPad mini or a $100 gift card to Mancy’s Restaurant. Followers of our LinkedIn Seminars & Trainings page who attend the seminar will not only have instant access to all of our seminar information, webinar details, and training videos, they will also exclusively have a chance to win a $25 Visa gift card. Register for the October 1, 2015 seminar and follow our LinkedIn Seminars & Trainings page for full details and a chance at all 3 prizes! 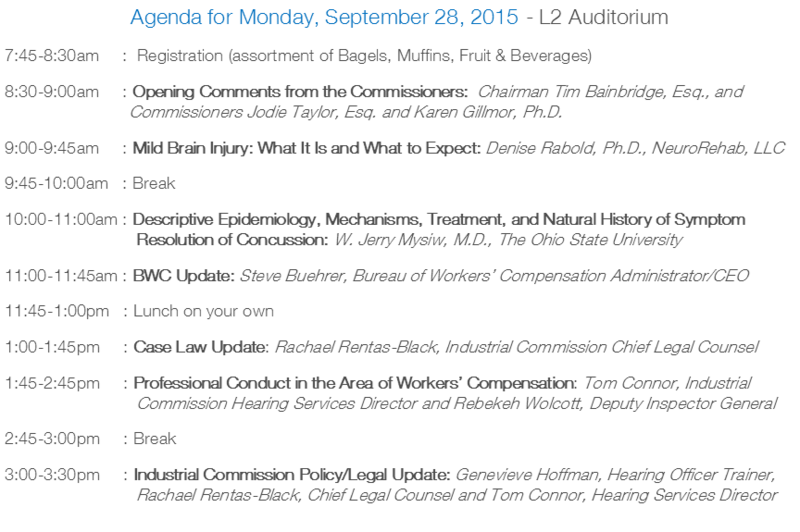 The Industrial Commission of Ohio will host a Statewide Hearing Officer Training seminar on September 28, 2015 in the L2 Auditorium, 30 West Spring Street, Columbus, Ohio 43215. Below is the full agenda. For registration information click here.